A modern data science tool to make machine learning accessible to all - like having your own personal data scientist! Today, big data is everywhere but hidden in plain sight. Most of us use machine learning without knowing it, but there aren't a lot of options to do data science if you're not a data scientist. Data science tools available are often limited only to business use cases for big corporations with stacks of money. Is there anything for everyday, personal use? We wanted to make data science accessible to everyone. We believe you shouldn't have to know how to use IPython/numpy/Jupyter/Spark/Hadoop/etc to get started with machine learning. Data is also rapidly becoming a greater part of our lives. DataTron is a modern web-enabled data science toolkit for normal people. 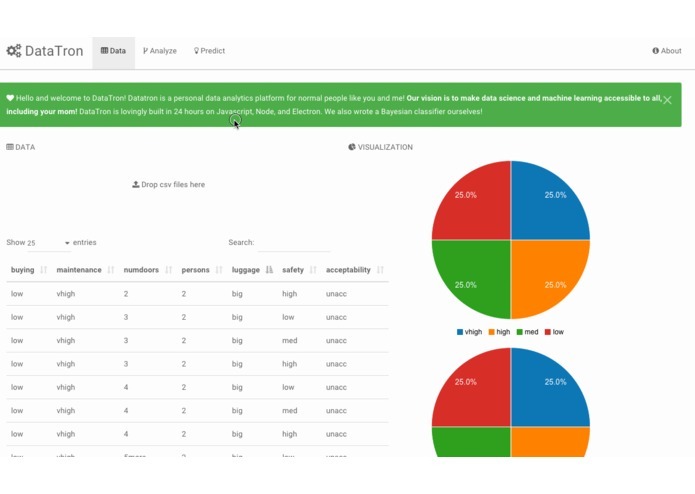 It lets you easily reveal insights from your data with just a drag-and-drop. Our vision is to make data science accessible to all, including your parents! 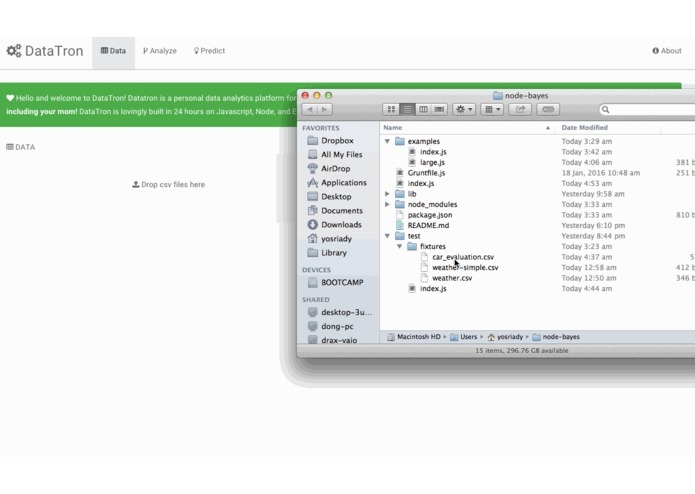 Drop a CSV file and let DataTron do all the data science work for you. It’s like having your own personal data scientist! DataTron automagically parses and trains classifiers on your data. Reveal the underlying insights hidden inside of your data through a Decision Tree classifier. Try it out at our booth! Get live predictions of your future data points using state-of-the-art Bayesian supervised learning. Try it out at our booth! Upload your dataset and share your link code with others! Writing our own Bayesian Machine Learning classifier from scratch! We wrote a full Naive Bayes classifier with Laplace smoothing and support for numeric attributes as a Node.js module over the hackathon. It's open source at https://github.com/Leventhan/node-bayes. 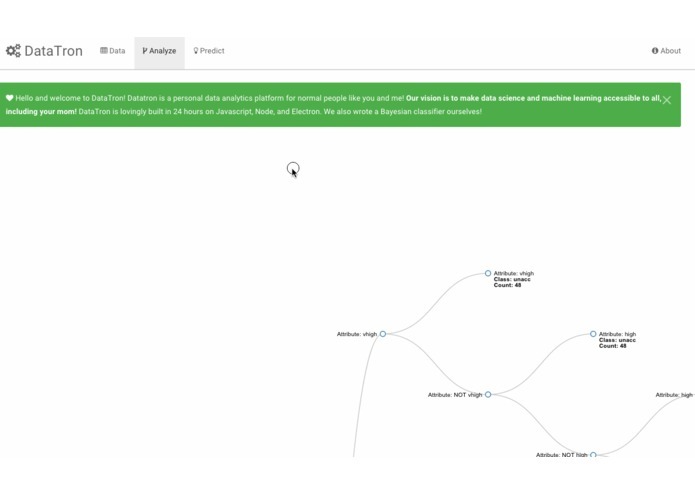 We developed a zoomable/pannable Decision Tree visualizer using D3.js and SVG. We spent time and effort making sure our UI/UX is as intuitive and straightforward as possible. DataTron is our first Electron project. After the hackathon, we plan to refactor and continue working on the app depending on public interest. Yos also plans to publish his node-bayes module to npm. Software craftsman based in Singapore. Thank you for visiting! Let us know what you think about DataTron.